Front Label: Standard, Moet-Hennessy (Suisse). Back Label: UWE, DGP white, DGP gold, CSS, Velier, None*. 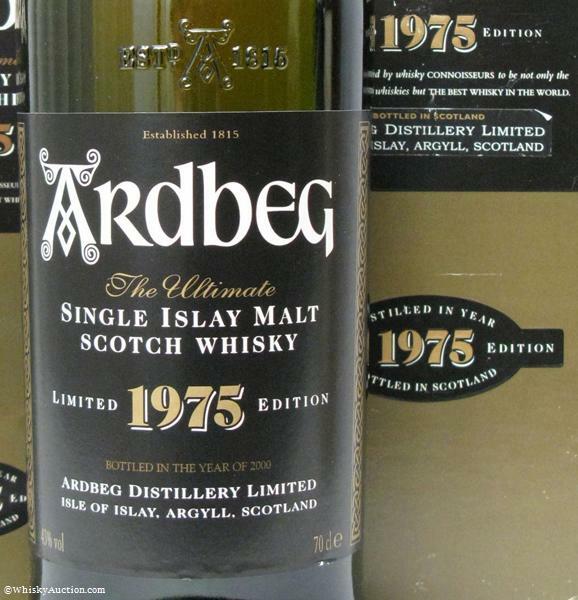 NOTE: Circa 1999 - Special offered if purchased from Ardbeg's Online Shop. 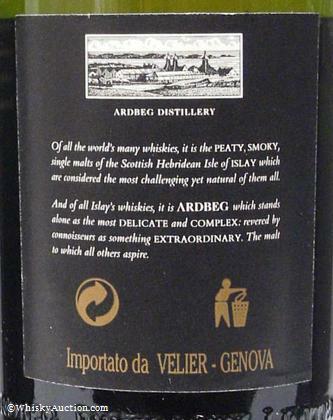 Original tasting notes as published on the Online Shop in 1999. 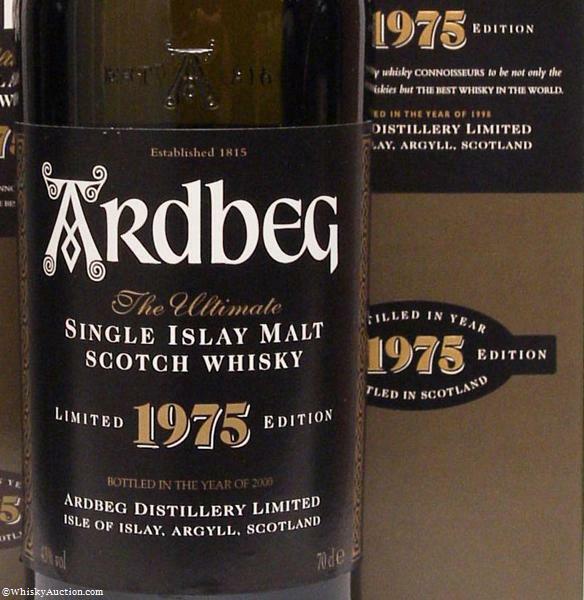 Ardbeg's 1975 Vintage - "Fabulous, absolutely divine"
Nose: Sweet and floral. Not only is there some heather in there but also a hint of lavender. 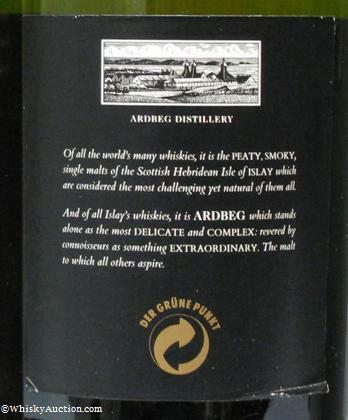 The smoke is gentle and unassuming, more happy to interplay with the oak to create these delicate floral tones. 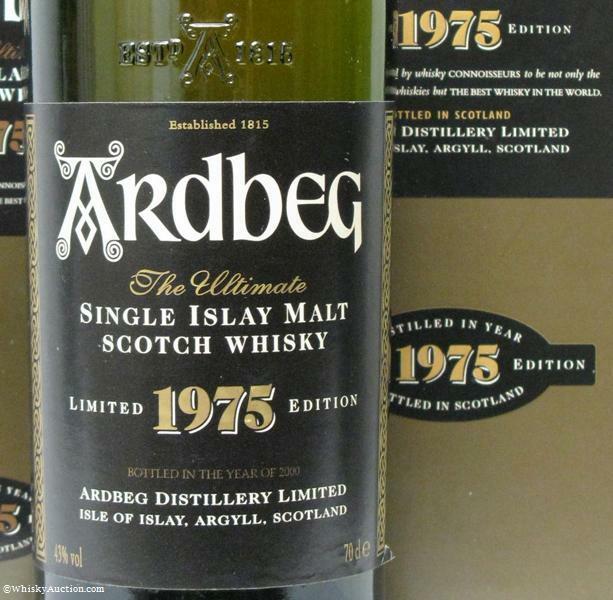 The great age can be detected by the faintest waft of pine but the malt hangs together with effortless poise. A nose as beguiling as it is complex. 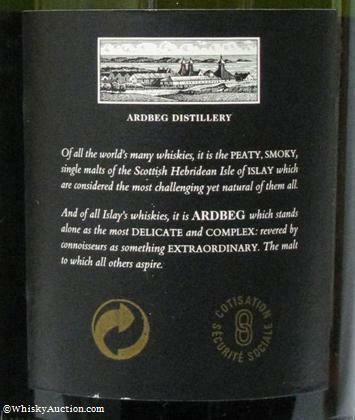 Taste: The peatiness makes a quite staggering entry. On the nose it has been slightly shy and retiring. 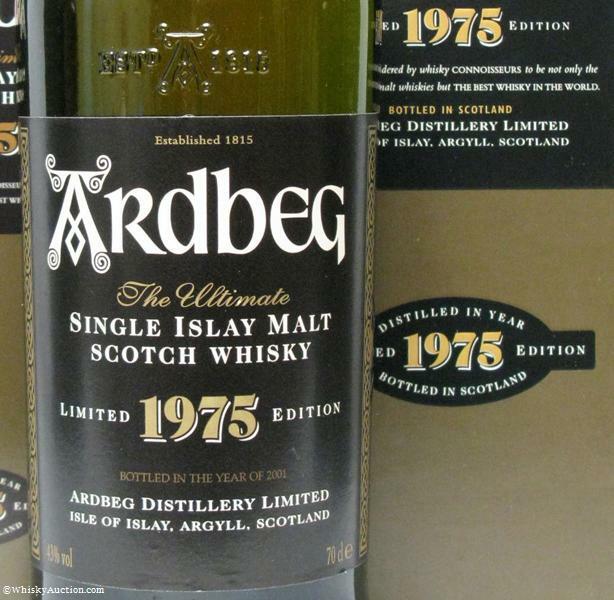 As it hits the palate you see an altogether different character: Immediately huge and mouth-filling, it seems to take a special fancy to the roof of the mouth where an almost sensual oiliness allows it to cling for ages. Attached to this peatiness is a quite delicious and teasingly slow build up of cocoa as the oak again superbly interacts with the phenols. 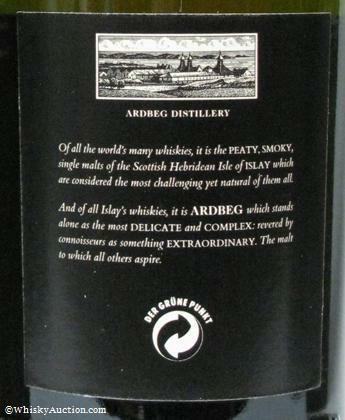 Finish: This is what you pray for from an Ardbeg: a long, almost never-ending finish with the peat refusing to leave the stage. There is also a lingering sweetness which lasts right through from the very first taste. 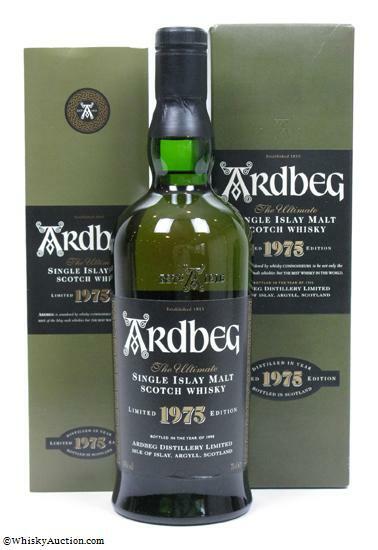 The oak does add its usual vanilla character and the malt also makes its presence felt as a constant within the sweetness but everything is very low key and supremely. 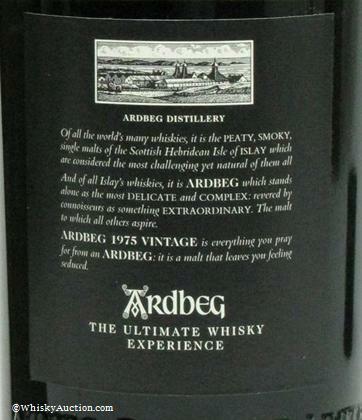 Bottled in 1998 front label. 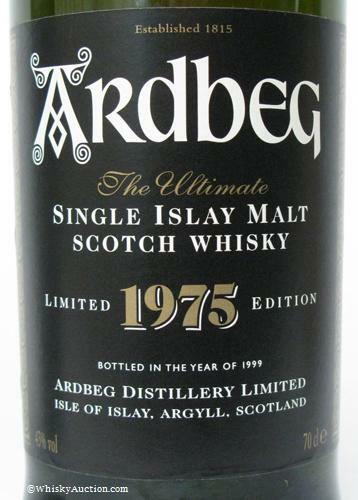 Bottled in 1999 front label. Bottled in 2000 front label. Bottled in 2000 (MH-Swiss) front label. 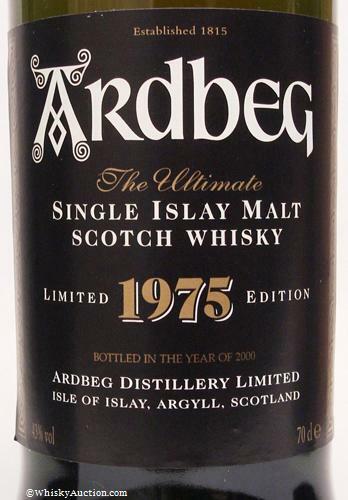 Bottled in 2001 front label. 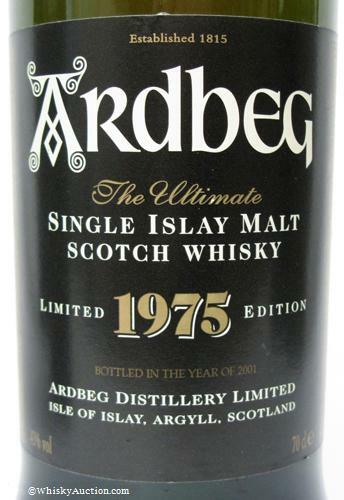 (The only back label with a reference to 1975). Velier-Genova back label. Der Gr�ne Punkt (DGP) 'white' back label. Der Gr�ne Punkt (DGP) 'gold' back label. *-The missing back label could be due to faulty adhesive or even removed and cleaned. It is possible that a back label was never attached, but this can't be substantiated. This section was added to explain the changes made to the box. They seem to be made at the bottling or packing facility, and I believe there are more varieties. However, since boxes can always be changed after distribution, this is meant only as a guide to display my 'unofficial' interpretation of the differences. 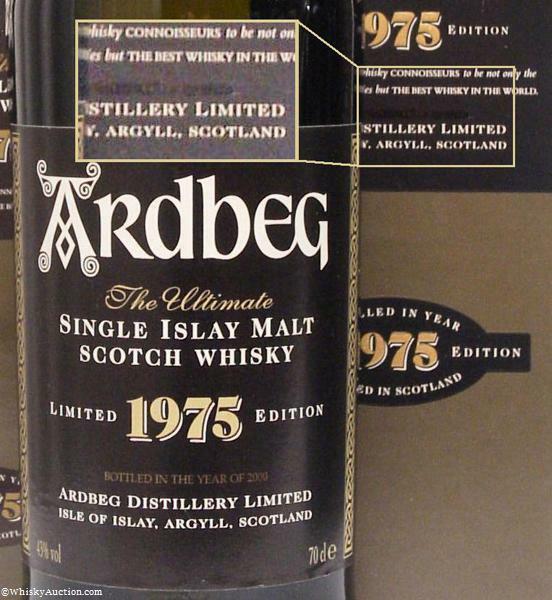 1998 bottle with 1998 box. 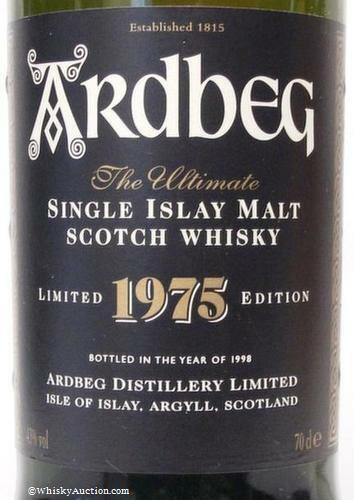 1999 bottle with corrected box (1999 sticker added). 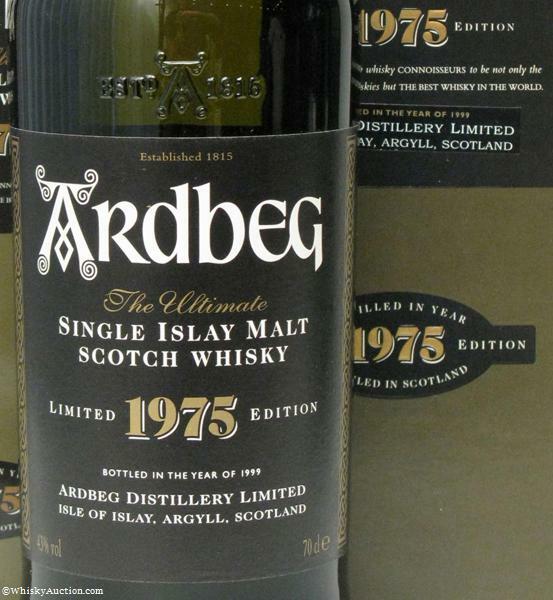 2000 bottle with 1998 box. 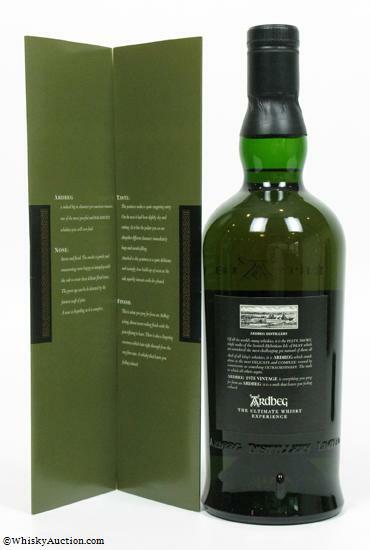 2000 bottle with corrected box (1998 blacked out). 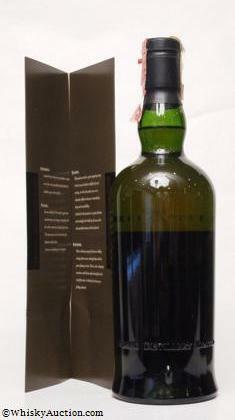 2000 bottle with corrected box (Sticker with no date added). 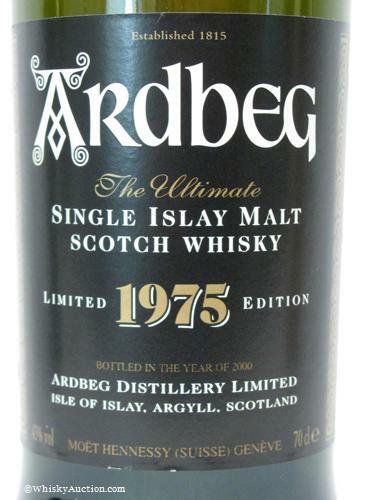 2000 bottle with undated box. 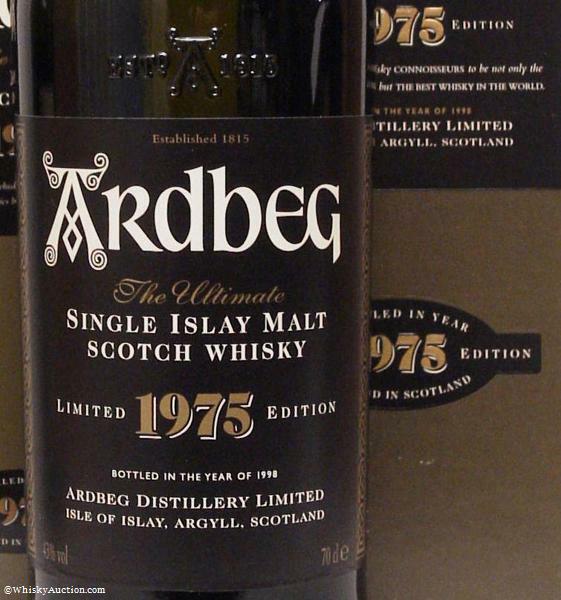 2001 bottle with undated box.